Much to the chagrin of sports bettors holding Boston College and UNDER tickets, the First Responder Bowl was cancelled in the first quarter due to weather. 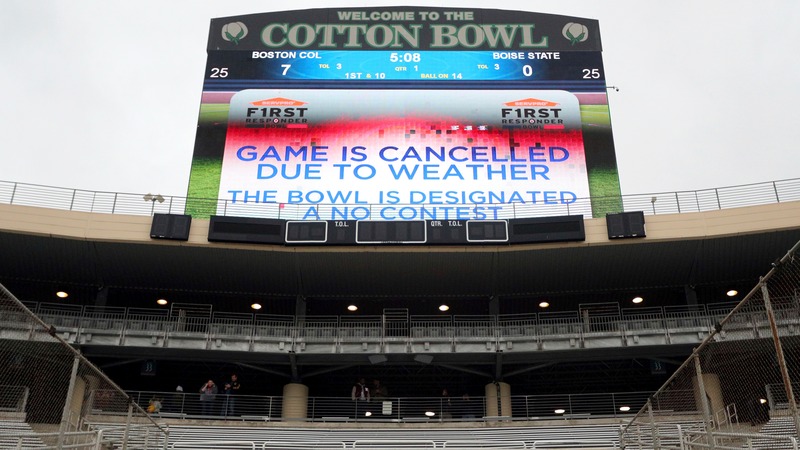 Mother nature delivered an early upset in Wednesday's college football bowl games, forcing officials to cancel the First Responder Bowl in Dallas between Boston College and Boise State due to inclement weather. The game was called off 9:52 into the first quarter with 3-point underdog Boston College holding a 7-0 lead. The game was ruled a no-contest, and all stats accrued during the game won't count. Essentially the game never existed, much to the chagrin of sports bettors holding Boston College and UNDER tickets. Thunderstorms and wind were expected to continue throughout the day and night. <a href="https://twitter.com/FRBowl/status/1078013508787290112" class="embedly-card" data-card-width="100%" data-card-controls="0">Embedded content: https://twitter.com/FRBowl/status/1078013508787290112</a> All bets on the game were refunded at the Westgate LV SuperBook and offshore at Bovada. Parlay tickets with a leg containing a bet on the First Responder Bowl will simply get reduced. How sportsbooks handle refunds on the First Responder Bowl may vary. For example, at offshore sportsbook BetMyBookie, all parlays and teasers were reduced by the game except for 10-point special teasers, which are now completely void. <a href="https://twitter.com/betmybookie/status/1078027375668088832" class="embedly-card" data-card-width="100%" data-card-controls="1">Embedded content: https://twitter.com/betmybookie/status/1078027375668088832</a> ## Minnesota (+200; +5.5) ruins Paul Johnson's swan song Georgia Tech was one of the more popular picks this bowl season as over 75 percent of bettors ([sharps included](https://www.betchicago.com/college-football-bowls-betting-lines-trends-predictions-sharps-gt)) expected a final win under coach Paul Johnson over Minnesota in the Quick Lane Bowl. Minnesota was a 5.5-point underdog that was allowing over 5 yards a carry but it was the Yellow Jackets that ended up getting gashed on the ground for 262 yards in a 34-10 upset. Minnesota cashed as +200 moneyline underdogs thanks to Mohamed Ibrahim's 224 rushing yards that helped keep Georgia Tech's triple-option attack off the field. Gophers QB Tanner Morgan connected on just seven passes in the game but they went for 132 yards and two scores, both to Tyler Johnson, who broke a Gophers record for most receiving TDs (12) in a single season. UNDER 57 easily cashed but only 32 percent of bettors expected a lower-scoring game, per Sports Insights. Make sure to check back here with BetChicago for a full recap of bad beats, crazy finishes and everything that happened in Wednesday's bowl games.